Hoods are used for decoration of supply and exhaust ventilation system vents. The EH-17 hoods are the perfect complement to residential, public or industrial spaces. 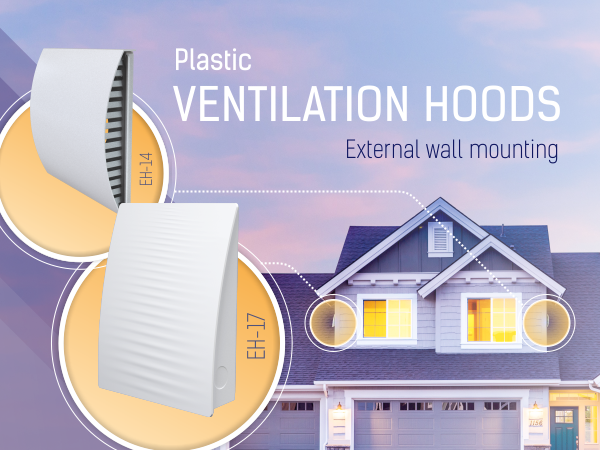 Thanks to the UV-resistant material the EH-17 series, which includes hoods for round 100 and 160 mm air ducts, is ideally suited for outdoor duty in addition to a host of indoor applications. The EH-17 160 model is also compatible with TwinFresh single-room ventilators. The internal surfaces of the EH-17 ventilation hoods have a PU foam layer for additional noise insulation.